In ants, workers are sterile, mating only affects males and princesses, we recognize them through their wings. During the nuptial flight, the princesses will encounter males of neighboring colonies for reproduction. In France, breeding period will generally spend from spring to mid autumn, during the hot and stormy nights. In the air or ground, males mate with the female, then they die quickly, while the female is carried away by the wind, landing far from its nest It will keep the sperm lifetime. 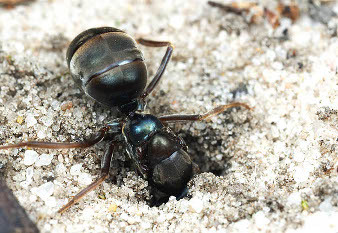 Once fertilized, the queen will begin searching the perfect place to found its colony. Sometimes the queen eats its own wings, but it is mostly its wing muscles which provide energy. Finally, she locked herself in an underground room and begins to lay. Once protected, the queen should take care of eggs and larvae for weeks, sometimes even eight to nine months. The first eggs are small and the queen eats some to stay alive. 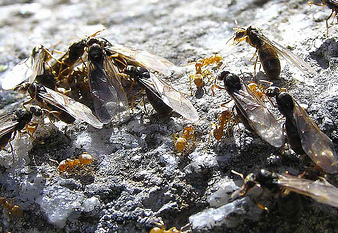 The colony grows gradually with the birth of the first workers who replace the queen as nurse and begin to seek food outside. After one to five years, when it is developed, the colony starts its reproductive stage. Now, resources are invested in new queens and males.